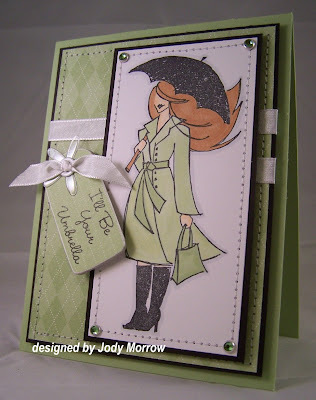 I used my drunken watercolor technique for this card. I cut apart my acrylic stamp so that I could change the orientation of the sentiment. Originally it was one long piece, but I cut it into 3 pieces. These are wonderful. You are a genius with that drunken watercolor. I used it to color a Prima flower w/ drunk aquapainter and reinker and it came out GREAT and no damage to the paper flower like with water. The umbrealla series..hee, hee, hee. So cute! I like the dimension of all the panels and your coloring! 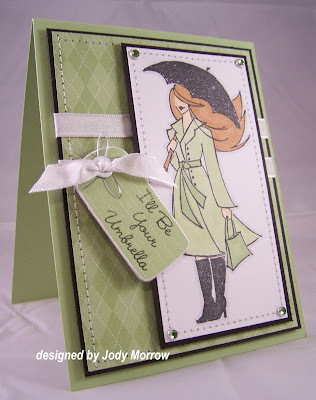 I love this card- even the shade of green s perfect for a rainy day!